As a Managing Director at Deutsche Personal Wealth, Elaine Lim-Chan understands the value of performance, a skill she has carried into her love for cars. In the world of private banking, there is little room for ignorance. For financial experts like Elaine Lim-Chan the ability to combine market knowledge and relationship skills is what it takes to be successful. After 18 years in finance, Ms Lim-Chan knows what it takes. Along the way, the elegant-looking banker has parlayed her professional expertise into her love for cars. “My husband was actually the one who got me interested,” Ms Lim-Chan remarked about Dr Chan Kok Weng, a dermatologist, and his love for cars. “We both love to drive and enjoy taking overseas driving holidays. One year, we customised an itinerary for 10 cars driven by friends that started from Munich and took us through the Alps. Ms Lim-Chan’s test-drive vehicle for the day is the BMW 730Li, a model that is not short on features nor capabilities. The BMW 7 Series sports a slew of advancements that enhances the 2.0-litre, four-cylinder, in-line powerhouse with BMW TwinPower Turbo technology. 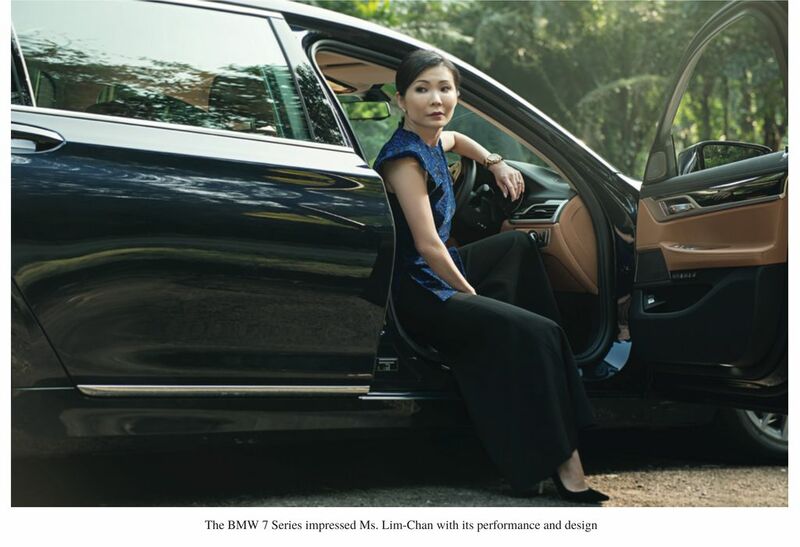 Ms Lim-Chan is thrilled with the BMW 730Li’s 258hp output and ability to get from 0 to 100km/h in 6.2 seconds. Despite the power, the state-of-the-art sedan is also equipped with EfficientDynamics technology such as VALVETRONIC, Double-VANOS. Ms Li-Chan also admitted that performance aside she was most impressed with the fuel efficiency of 6.3 litres per 100km that leads to fewer trips to the gas station, and accompanying average CO2 emissions of 146 g per kilometer. And naturally, comfort and aesthetics enhanced by the ample legroom in the spacious BMW 730Li, as well as the leather and wood panelling of the luxurious interior, further add to the refinement. 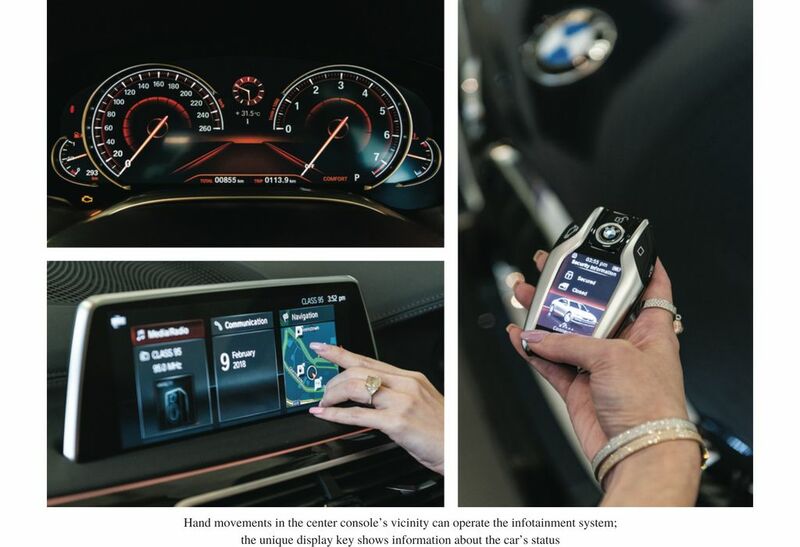 Beyond the top-notch ambience, the BMW 7 Series also has Gesture Control with its iDrive operating system, a feature that a busy banker scooting about town would find most useful. Thanks to a 3D sensor, hand movements in the vicinity of the centre console can operate features on the infotainment system. “The ability to adjust the volume on the radio, or to take and make calls without even touching the dashboard can be very useful, and safe,” she admits. Another aspect of the BMW 7 Series Ms Lim-Chan found extremely useful was the display key. “BMW’s new display key is a quantum leap into the future from regular remote keys,” she remarked. The integrated display on the unique display key shows information about the car’s status including status of locking system, windows and glass roof, and service notifications. “I like the fuel-level information on the display key. “When the petrol is low, I can get my dad or my husband to go top it up without my even getting into the car,” she joked. She’d be relieved to note that not only does the key come standard with all new 7 Series models, but it can also be charged wirelessly or easily with the USB cable. Amazingly, a BMW key can do much more than show status information for the car. It can also activate the optional remote control parking feature that comes with the BMW 7 Series, making the model the first production car in the world that can manoeuvre in and out of forward parking spaces up to one and a half times the length of the car without the driver being behind the wheel. In addition to the supercars Ms Lim-Chan and her husband have owned through the years, they’ve also had a range of BMWs that include the 3, 5, 6, 7 Series and an X6. That’s one model that will not only tick all her performance boxes, but also provide ultimate luxury as a bonus.